Attack to the right of the initial plaque in A1 of the Via Sacchi [report available on the Vol. Presanella of the Guide of the Mountains of Italy CAI TCI]; after a first jump, go left onto a small terrace (pay attention to a slightly mobile rock) and traverse to the right on a wall until you find a splendid black dihedral that runs up to the edge (6b). Continue to the left of the line until you stop on a comfortable terrace (V + / 6a). Cross to the left on a very smooth wall (intersection with Via Sacchi) and climb over a large dihedral reassemble on a pylon lying down until the stop (6c). Still straight (spit) you reach the Via Sacchi for plaque and follow it up to the top (IV +). 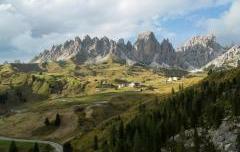 Access from the Segantini Refuge to the path of the 4 Cantoni Pass (1 hour). Note: from the second stop, the stupendous vertical crack at about half of the initial wall of the third pitch was also raised from below, with very high difficulties, a stop on a terrace at the exit. Level: 6 C, 6A OBBL.